StreamlinedDIY Toolbar is a browser plugin that works on all the browsers. It should enable users to access various home improvement tips, recipes, technology tricks and more; however, people who install this application on their computers notice a new search engine set in the place of their homepages. Yes, you will see a toolbar at the top with buttons leading to DIY websites, but it is not worth keeping StreamlinedDIY Toolbar installed just because of that. It is because you do not need to have it to be able to access those websites. In addition, you will be forced to use the search engine hp.myway.com it will set. 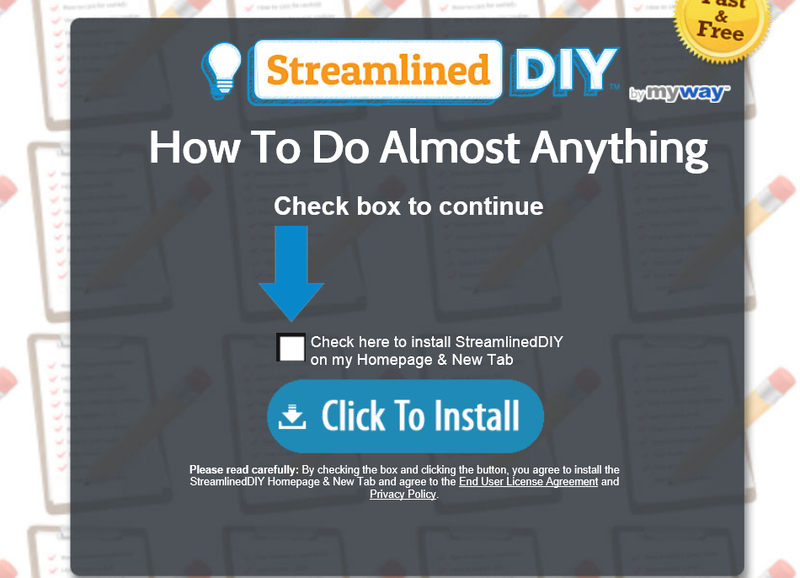 If it is hard for you to decide whether or not to remove StreamlinedDIY Toolbar from your computer, you should read this article – we are sure you will find all your questions answered in it. You will find more information about the StreamlinedDIY Toolbar removal there too, which would be useful if you decide to erase this browser plugin from your browsers. What does StreamlinedDIY Toolbar do? Once StreamlinedDIY Toolbar is installed, it will immediately change your homepage on all the browsers. From the moment of its entrance, you will have to use hp.myway.com. This search engine does not look bad at all at first glance, but, according to specialists, it is quite risky to keep it and use it to search for the information because it is known to be capable of providing users with all kinds of commercial ads. They will not appear in the form of pop-ups or banners, but you will see those commercials inserted among those reliable search results. Of course, only those more experienced users could tell which of the search results are sponsored and which are trustworthy. Clicking on wrong commercials might result in the redirection to bad websites. In other words, you might enter untrustworthy web pages against your will by using the search engine set by StreamlinedDIY Toolbar as your default search tool. Honestly, this is not the only reason the StreamlinedDIY Toolbar removal is recommended. You should also get rid of it because it has been found that it can gather data associated with the user’s Internet activity. How did StreamlinedDIY Toolbar enter my computer? It is known that StreamlinedDIY Toolbar has an official website and can be downloaded from there; however, if you are sure that you have not downloaded this browser plugin yourself, it is very likely that it has entered the computer in a software bundle. Other Mindspark Interactive Network, Inc. products are available too, but we suggest that you do not install any of them because they act very similarly to StreamlinedDIY Toolbar. How can I delete StreamlinedDIY Toolbar? To remove StreamlinedDIY Toolbar from all your browsers, you have to remove the extension that belongs to this browser plugin and then set another search tool instead of hp.myway.com. The quickest way to do that is to reset browsers. Of course, if you wish to uninstall StreamlinedDIY Toolbar automatically, you should delete StreamlinedDIY Toolbar with an automatic malware remover. Not all the tools will implement the StreamlinedDIY Toolbar removal for you, so make sure you use reliable software.